Stand – MS in 12 swg Round pipe. Door – SS 304 in 12.5 mm Thickness. Locking Rod – M.S.chrome plated in 20 x 20 mm Thickness. Working Pressure: 1.2 kgf/cm g for 15 Minute quick & perfect sterilization. 2.1 kgf/cm g for 07 Minute quick & perfect sterilization. Working Temperature: 121 °C for 15 Minute quick & perfect sterilization. 134 °C for 07 Minute quick & perfect sterilization. Sterilization period : 15 to 20 minutes maintaining above pressure and Temperature in chamber. Pressure locking device so that the door cannot be opened Till pressure is fully exhausted from the chamber. 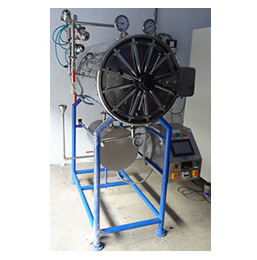 Apparatus chamber vacuum which helps in quick drying. Jacket air valve for automatic air removal. Safety valve: A safety device against excess pressure in jacket/ steam Generator. Chamber temperature gauge : Provided a dial type thermometer at front in discharge line to indicate sterilization temperature. Plug Screen: A device to prevent large particles from entering chamber. Check valve for perfect condensation from chamber to Achieve optimum temperature. Pressure gauge: To Indicate steam pressure in Jacket & boiler. Compound gauge: To Indicate steam pressure and vacuum in chamber. Drain line: Connected with out let S.S. funnel junction and water trap Arrangement to avoid air contamination. Water immersion type industrial heating elements. (I.S.I. MARKED) 18/ 12 kw. A magnetic automatic water level switches to protect heaters. Water level indicating gauge glass tube with S.S. guard. Automatic pressure stat switch to control the boiler Jacket pressure. Electrical Control box : Equipped with Heavy duty Air break contactor Heaters ON-OFF and process toggle switch indicating lamps.